Are you an ailurophile? If yes, then you will have a fantastic time at Bengal Brew Cat Cafe at the Manhattan Parkview in Araneta Center. 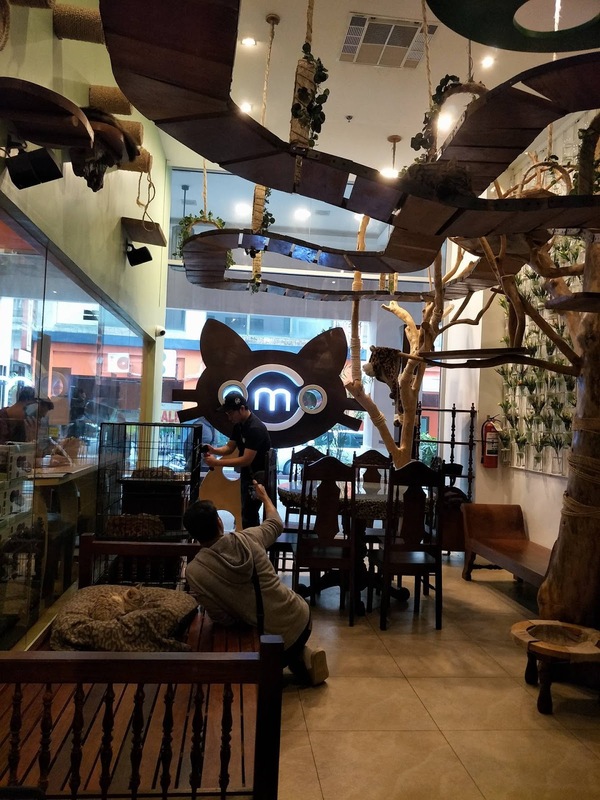 This is one of the first cat cafe to open in Metro Manila last year and since its opening day, tons of cat lovers have already visited the place. Bengal Brew is a block away from Gateway Mall in Araneta Center. It is at the back of Kia Theatre. 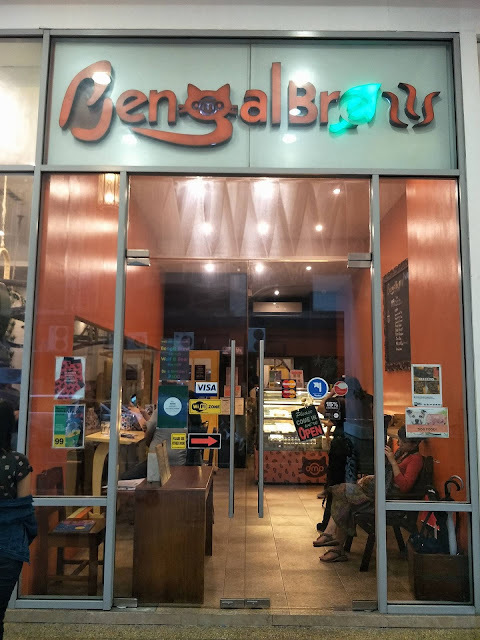 However, some may not really realize that Bengal Brew is a cat cafe and will just think that it is just "another" coffeeshop since the cats are not really visible from the entrance. But if you will just move a bit to the left side of the entrance, you'll see behind the glass wall that its full of cats. 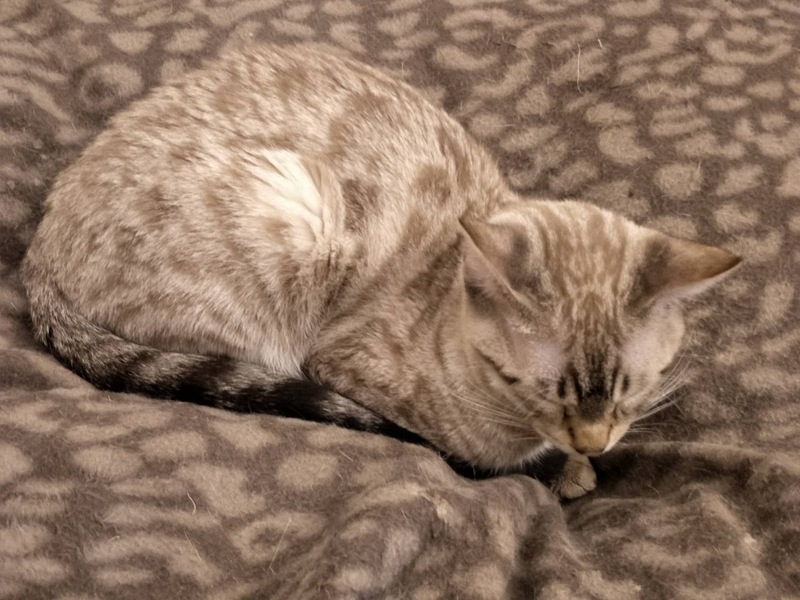 This is Lucas, he is an African Serval cat. 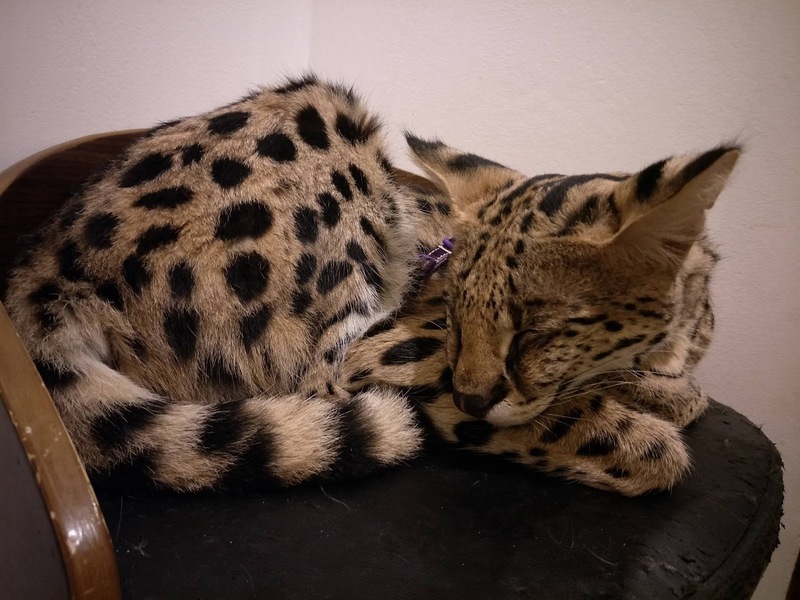 I've checked Google and found out that the serval is a wild cat found in Africa. Lucas is domesticated though so you need not worry about the "wild" cat thingy. Unlike the usual cats that we know, the serval is slender and has long limbs compared to the other breed of cats. Here is Lucas, he looks huge in this photo. 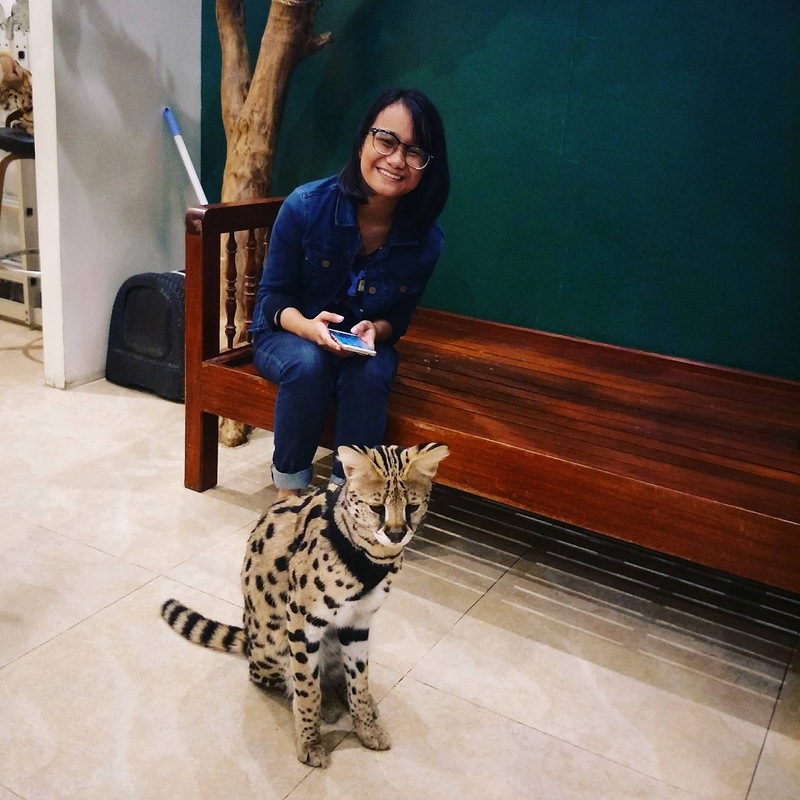 The serval though are kinda snobbish and won't approach you like the other cats. But if he likes you, he will allow you to pet him. 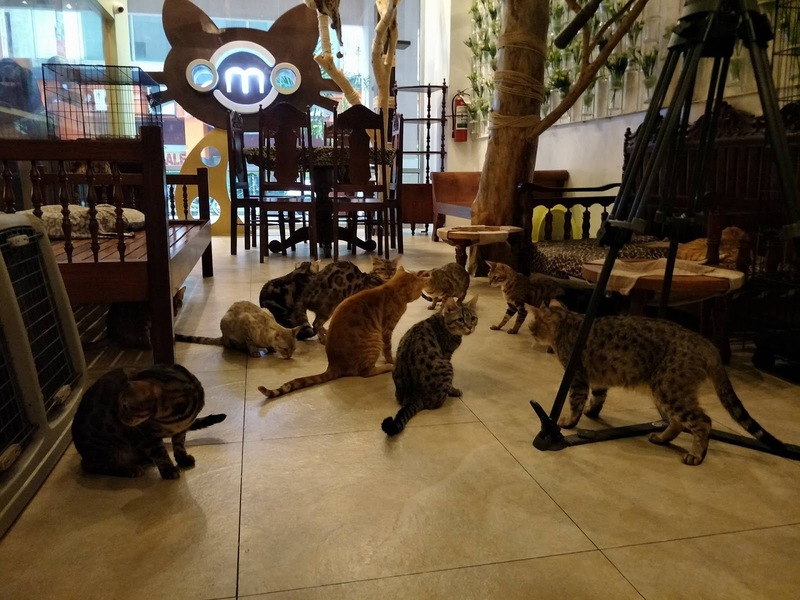 Its spacious enough inside the cat cafe and this is just the front area that is visible from the outside. There are tables and chairs for the guests although it is mostly occupied by cats. If I am not mistaken, I think there are more than 30 cats (2 African Serval and the rest are Bengal). I also didn't realize that cats can also blend in well in their surroundings like this cat here. I almost cat down on it. Alas, most of the cats were sleeping, or pretending to be asleep when we visited Bengal Brew. Luckily, the staff was there to make sure that we enjoy our visit so he got some cat "treats" from the drawer and that almost every cat became awake at once. You can also buy the treats from the counter so that you can experience feeding the cats yourself. Be warned though because cats are so eager for treats that you'll find yourself surrounded in no time. When it opened, Bengal Brew is just a cat cafe but they want to make the Cynophilist. What's that? 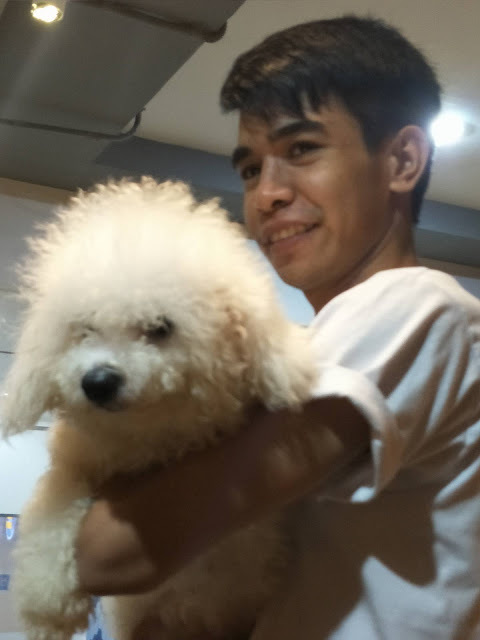 In simple term, that's what you call a dog lover. 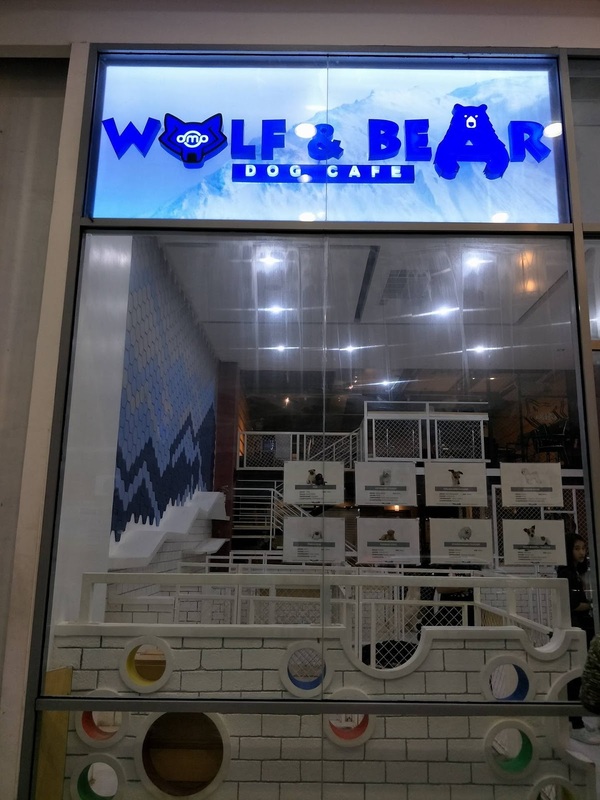 Wolf & Bear Dog Cafe opened early this year and its made a lot of dog lovers happy. 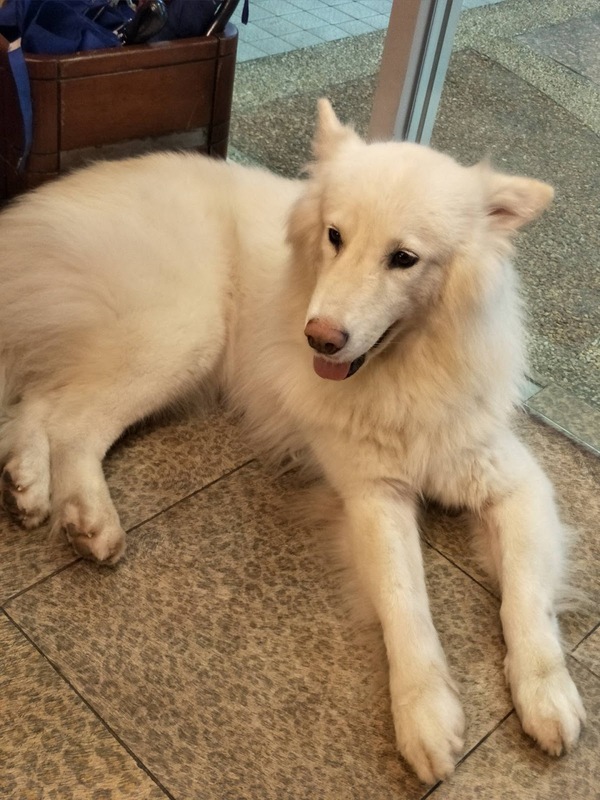 The dog cafe is just beside the cat cafe but you need to pass by the cat cafe area to go there. 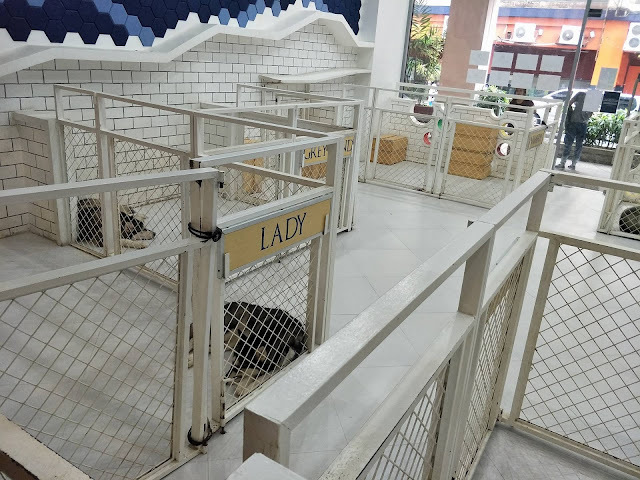 And you are lucky if you are a certified cat and dog lover because you can visit both areas. Here's one of the "big" dogs at Wolf & Bear. I forgot the breed (sorry, not a dog person here) but it looks like a "wolf." 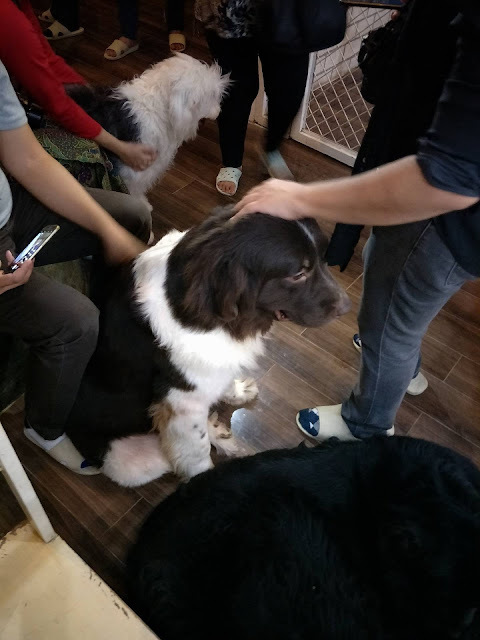 Some of the "big" dogs are named after the GOT (Game of Thrones) direwolves so it was really fun. I don't want to spoil things for the dog lovers out there so I just took a photo of their nice pens. And here's an overly friendly dog who likes "pats" and "rubs." 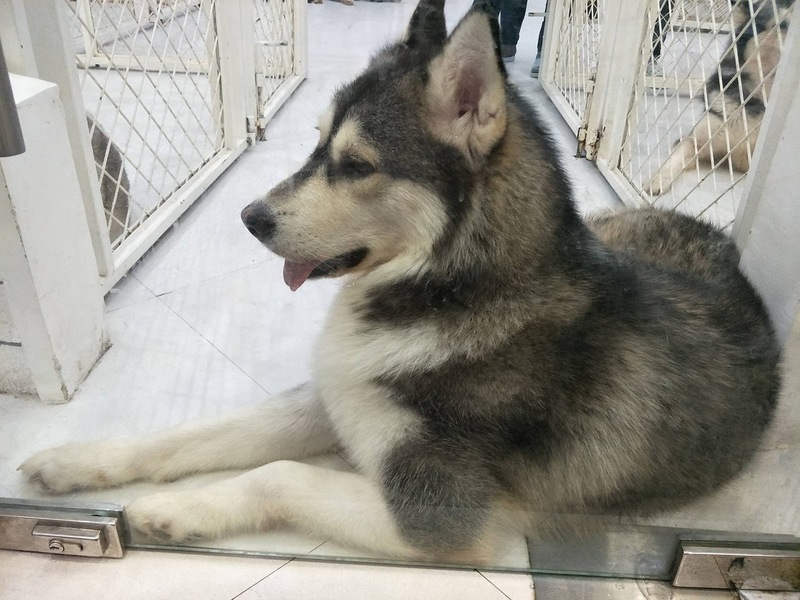 He was blocking the way to the second floor where the small dogs are kept. You can just imagine the mayhem if all the dogs are together. There are also tables and chairs for the guests inside Wolf & Bear so that the guest can enjoy interacting with the canines. This doggy here was so excited for his afternoon "walk" schedule that he was camping near the entrance and counting the minutes until it is time for him to go out. 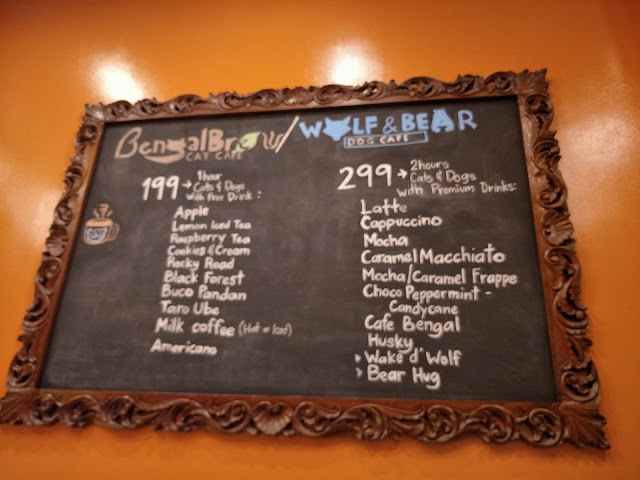 Here are the rates at Bengal Brew / Wolf & Bear. Drink is inclusive for the 1 hour or two hour stay inside the cafe. If you want to eat, yes, there are pastries, you can buy that as well from the counter. I do advise you though so skip ordering for yourself and buy "treats" for the cats and dogs instead.